LONG-TIME FORRESTER EXECUTIVE PROMOTED TO NEW ROLE IN 2017. Effective earlier this year, Forrester Construction promoted Donald Free to the role of vice president overseeing the firm’s preconstruction services, estimating and purchasing groups. Don has more than 30 years of construction industry experience and has managed dozens of successful projects during his eleven year career with Forrester. Most recently, he served as a project executive overseeing all aspects of various commercial, education and public sector projects including important work at Arlington National Cemetery and Prince George’s Community College. Before joining Forrester in 2005, Don worked as senior purchasing agent, senior project manager, and cost engineer for a large national construction firm. Early on, Don gained expertise with all aspects of project procurement ranging from scoping, bidding and purchasing, selecting subcontractors, negotiating contracts and managing all aspects of his projects. He has a reputation for proactive problem solving and maintaining strong relationships with clients, project partners, subcontractors and colleagues. With both Bachelor and Master of Science degrees in civil engineering from the University of Maryland, Don has been a mentor to many young professionals throughout the years. He is also very involved in the local community, particularly the Boy Scouts of America which he has been active in since 2003. 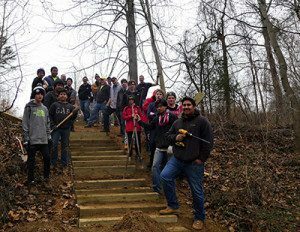 He was even featured in a recent article published by The Town Courier | Gaithersburg for his support of a budding future engineer’s Eagle project. In his new role, Don will oversee a diverse, talented group as they work closely together to provide new and existing clients high value-added preconstruction services. This will involve leading Forrester’s cost estimating, conceptual budgeting and purchasing efforts as well as continuing to foster Forrester’s valued subcontractor partnerships. As a senior manager, Don will continue playing an important role in the company’s strategic growth. To get in touch with Don or learn more about his experience, visit his LinkedIn profile. For more information on subcontractor partnerships, what is bidding now and how to become prequalified, visit www.forresterconstruction.com/subcontractors.